Once again, delightful memories of childhood, this soup was a winter staple at our house and this recipe has been passed down for at least 4 generations. 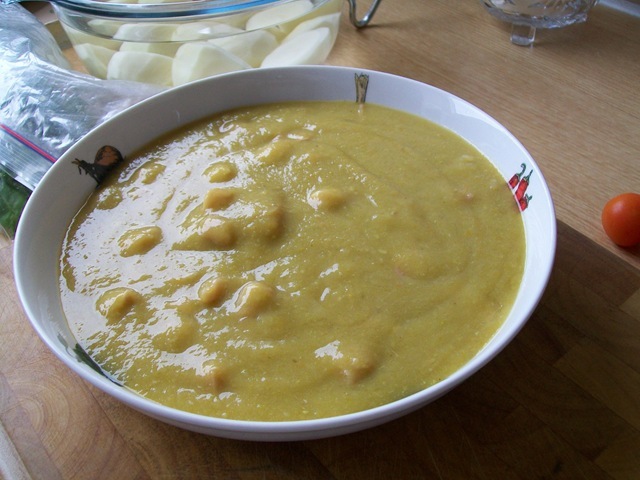 There is a lot of history to pea soup and not just in Lancashire, The traditional English pea soup was made with dried peas, and its greeny-brown colour was so similar to the dense smog that dominated London in the winter (until as late as the 1960s), that the smog became known as a ‘pea-souper’. In Bleak House, Dickens referred to the fog as the ‘London Particular’, and the name has been used for both fog and soup ever since. Dried peas are a healthy and nutritious low-cost vegetable. They make an excellent meal extender and when puréed, they form the base of many dishes from the traditional pea soup to the more unusual vegetable pâtés and fritters. Soak and cook more dried peas than necessary. They can be refrigerated or frozen all set to serve as a vegetable or added to casseroles, pies, and soups. It is a little less trouble to make the soup with split peas, which have no skins, and here there is a selection of green or yellow. While there is no difference in the taste, the latter give the soup a pleasing golden colour. Soak the peas as directed on the packet (or see notes) then in a large soup pan add the peas, water celery, carrots, onion, thyme, salt, and pepper. Bring to a boil and boil for 3 minutes now reduce the heat to slow simmer cover the pan and cook 45 to 60 minutes until the peas are tender. Add the parsley and simmer uncovered for about 45 minutes until thick now you can puree the peas in a blender or pass through a sieve or just leave as is if you like a chunky soup. Fine-tune the seasoning, add the diced ham, and serve with a swirl of cream or a sprinkling of chopped parsley on top. Overnight Method, Put 1 cup / 200grams / 7 ounces dried peas into a large bowl with 3 cups / 700ml / 1¼ pints tepid water. Do not add any salt. Quick soak Method, Put 1 cup / 200grams / 7 ounces dried peas into a large saucepan with 3 cups / 700ml / 1¼ pints water. Bring to the boil and continue to boil for 2-3 minutes. Turn off heat. Cover pan and leave to stand for one hour. Cooking dried peas, on the stove drain the water from the soaked peas and move peas to a large saucepan. Cover with plenty of fresh water, cover and bring slowly to the boil and boil rapidly for 10 minutes then reduce the heat to a simmer cook for 40 to 50 minutes or until tender. The longer the soaking time, the shorter the cooking time. If necessary add salt during the last 5 minutes of cooking time. In a slow cooker, proceed as above, adding to the slow cooker after boiling rapidly on the stove for 10 minutes. In the microwave, soak 225g (½ lb) dried peas overnight. Drain peas then transfer to a 2 litre (3½ pt) glass bowl. Add sufficient boiling water to come 1.25cm (½") above peas. Cover and stand bowl on glass plate in case water boils over. Cook on full power for 30 minutes, checking water level after 20 minutes. Top up with boiling water if necessary. Keep covered and leave to stand for 10 minutes. 650-watt microwave. Store dried peas at room temperature in a covered container for up to one year. Canned peas should be stored in a cool dry place and should be used within one year. Soaked or cooked dried peas can be kept in the refrigerator for 2-3 days. Cooked dried peas can be kept in the freezer for up to 3 months. Ham stock is simple to make and it’s incredibly useful for enriching sauces and soups. Ham stock is very gelatinous and after being left in the fridge overnight, it will turn to meat jelly. Ooh scrumptious meat jellies. Do not whatsoever add salt it does not need it. To start the stock, cover the ham hock with cold water and soak overnight. Drain off the soaking water, and cover the ham hock with the measured cold water, bring to the boil and skim off any scum, then add the carrots, onions and celery, leave simmer gently (we call this ticking over) for about 30 minutes, then add the peppercorns and bay leaf, lightly simmer 2 hours until the ham is cooked through. Watch it carefully; you do not want the stock to reduce too much, strain off the stock, Put the ham to one side, and discard the vegetables and flavourings the ham you can use foe soups, sandwiches and even salads for pea and ham soup you will need about 3 pints.